Well worn. This torn Anthropologie catalog page and I have been through a lot together. I tried the pants when I was in NYC 2004 and loved them to death, but stupidly enough didn’t buy them. All the buttons are working ones, so you can basically button up the entire pants. I counted the buttons and there are approx 40 of them! I will settle for 30 hoping it’ll be enough since I’m petite. But sewing 30 buttonholes still feels pretty daunting. I might cheat a bit and only make proper buttonholes for lower part of the pants. 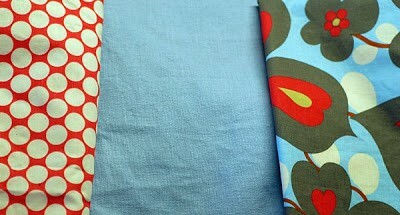 I’ve also ordered the fabrics for my daughter’s birthday present. I asked her what her favorite swatches was from my stash of over 100 cotton interlock samples that I got from E-slöjd. She picked these two, so now I’m all set. Made in Sweden. Sweden used to be known for it’s high quality cotton knits. Now most manufactures have closed shop, but E-slöjd still makes some fine stuff. When I visited Sweden a few years ago, I admit that I entered Marimekko and apparently fell into a time warp. I emerged a couple hours later with fabric and was so satisfied I didn’t find another fabric store the entire trip! 🙂 I did see so many knit clothes in clothing shops with very high-quality knit fabric. Can’t wait to see what you make with yours! Those pants are super cool. Anthropologie is just the best for knock-off ideas. Love those pants! Looking forward to your version. I love the pants! Leave in to Anthropologie! Love to see how you make them. I have the bug for summer sewing too. >>Christina: Yes aren't they genius! I love that they often add nice details to the clothes to make them special, which is similar to what we home sewers can do. >>Luckylibbet: I'll do my best 🙂 I've actually ordered some cheap stretch cotton so that I can sew a muslin first, I suspect that these pants might be semi tricky to get right.